This barricade is classified as an ADA safety rail and is compliant with all ADA guidelines and MUTCD 2009 edition standards. It will provide safe, continuous, detectable guidance for pedestrians, even those with mobility difficulties. The space between the bottom and the ground is less than 2” which will reduce the potential for trapped cane tips. This barricade also accepts pedestrian aids like warning lights and Audible Information Devices. The retroreflective sheeting helps guide pedestrians safely through work zones. 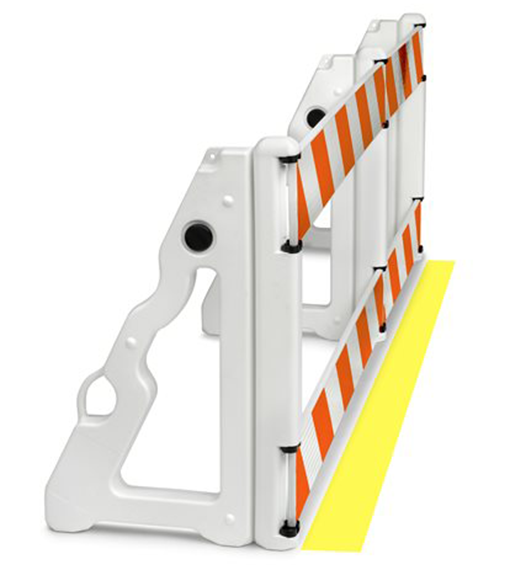 It also features a flat vertical surface which eliminates obstacles, like those found in most barricades.